These delightful little mini pillows of deliciousness are so fluffy and simple to make – easily ready to become your new favorite recipe!! Bake 3 russet potatoes until tender all the way through and allow to rest until cool enough to handle. Lightly beat 2 eggs with 2 tbsp olive oil, and then stir into flour/potato mixture. Mix gently until all is blended, and knead in another 1/2 cup flour. Your dough should be soft and supple, easy to work with and not too sticky. If you have trouble either way – just add either a bit more flour if it is too sticky, or a bit of oil if it is too dry. Divide this mixture into 4 balls. Roll each ball into a long skinny rope (snake if kids are helping!). Cut along length into pieces about 3/4 in each. Dust lightly with flour. 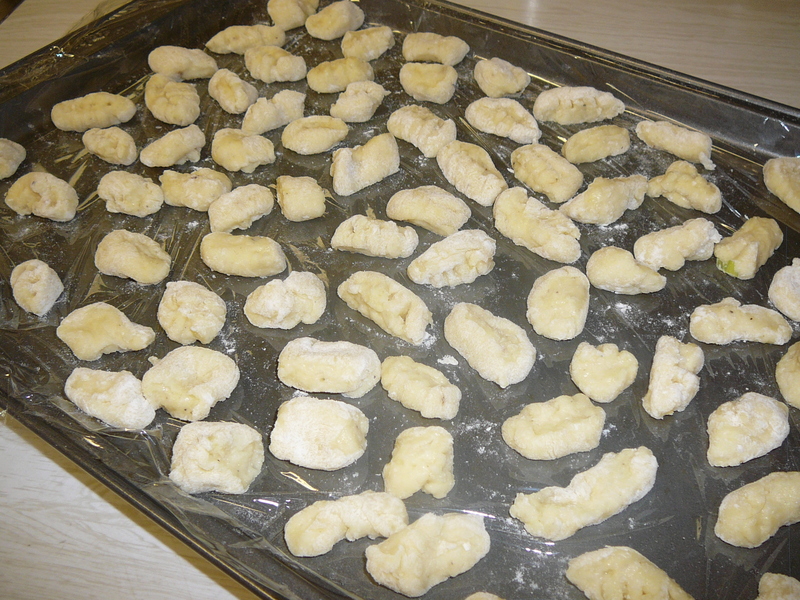 Keep a bit of flour handy – continue dusting your hand with it so the gnocchi doesn’t stick. Take a fork, and dust it with flour. Turn it upside down in your hand and roll the gnocchi down the tines of the fork. Set aside until ready to cook. When you have all the gnocchi rolled out – and remember that they don’t need to look perfect – you are ready to cook them. Hand made gnocchi – they don’t have to be perfect – just delicious any shape you get – neither Joe Bastianich or Mario Batali are going to criticize your form!! Boil a HUGE pot of water – when it comes to a boil toss in a generous amount of salt. At this point drop the gnocchi in the boiling water – it will return to the top when it is ready – let it bounce around for a moment and you are ready. 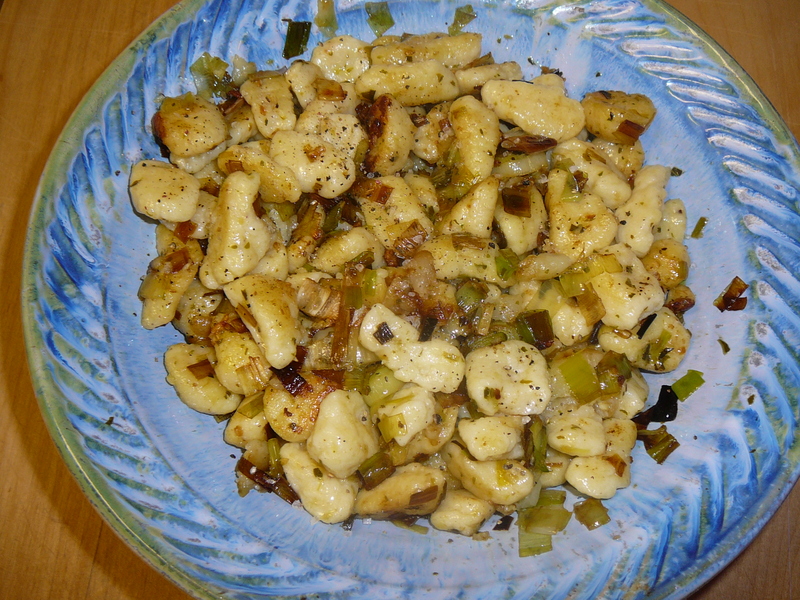 Really the gnocchi is great to eat just as is – toss it with melted butter, sprinkle with salt and pepper – delish. In a heavy bottom pan (like cast iron) heat 1 tbsp each butter and olive oil – stir the white parts of 2 leeks, and 2 garlic cloves until just tender. When the pot is really hot, push the leek mixture to one side, and drop the just boiled gnocchi onto the hot pan in small batches. As they crisp up push them over into the leek mixture and toss in the pan – using your hot spot to continue crisping up small batches of the gnocchi. Sprinkle with fresh herbs, salt and pepper and I guarantee you will love it! This entry was posted in Italian, Recipes, Vegetables and tagged gnocchi, italian, leeks, potatoes, side dishes by Chatty Kathy. Bookmark the permalink.